On May 14, 1948, the Jewish People's Council officially approved a proclamation establishing the independence of the State of Israel. The Jewish state was granted de-facto recgnition by President Harry Truman eleven minutes after the initial proclamation of independence, making the United States the first country in the world to recognize Israel. 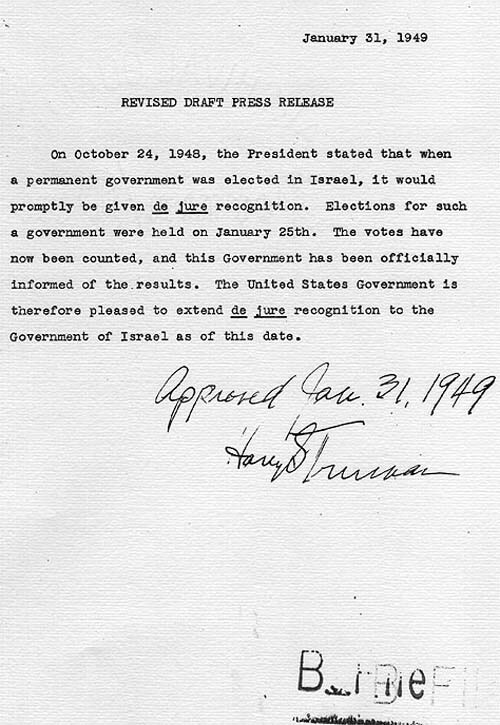 Less than seven months later, President Truman extended America's de-jure recognition to Israel. * De-facto recognition: Expression of international legitimacy "concerning fact"
De-jure recognition: Expression of international legitimacy "concerning law"